These Irish Potato Rolls are tender on the inside and crusty on the outside. They’re especially delicious warm with butter slathered all over them! Earlier this month I shared this recipe over at Made From Pinterest for St. Patrick’s Day. I was searching Pinterest for something Irish inspired to make and found a pin for Irish Potato Bread from Jo and Sue that sounded easy and tasty. I love homemade bread and use to make it all the time in my bread machine. Unfortnately I haven’t been making bread much lately but since this recipe is a quick bread and doesn’t require any yeast or proofing I thought I’d give it a try. The original recipe called for making this bread in a round loaf. Instead, I decided to make them into individual sized rolls in a muffin pan. 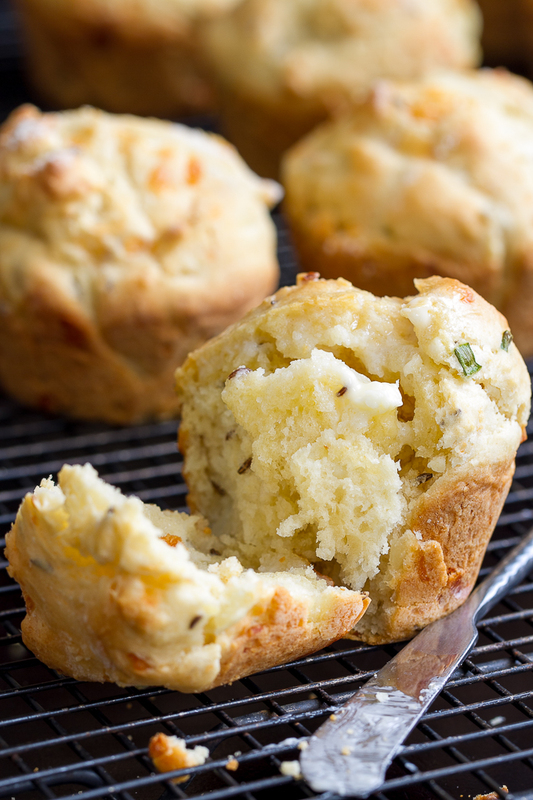 I love the crusty top of any bread and thought a muffin pan would be fun with lots of crusty tops! 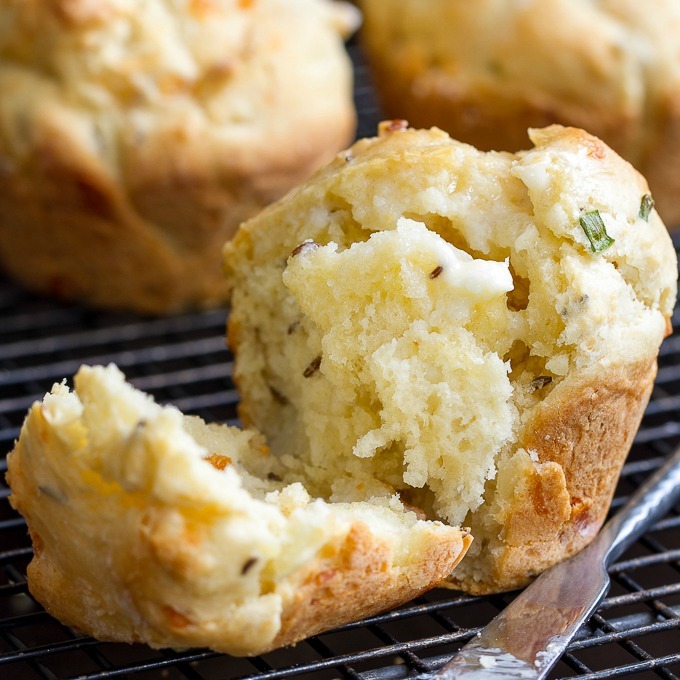 I loved the caraway seeds and chives in these Irish Potato Rolls and next time I would add even more! I also added a half cup of shredded Monterey Jack cheese which was a nice addition. I think these rolls would be awesome dunked in a bowl of soup or sopping up the yummy juices or gravy from your main dish meal. Preheat oven to 375. Spray muffin pan with cooking spray and set aside. In bowl, stir together chives, caraway seeds, flour, baking powder, and salt. In another bowl, add mashed potato, grated potato, egg, egg white, oil, and milk and stir until well combined. Lightly flour a work surface. Turn dough onto floured work surface and knead several times. Divide dough into 12 balls. Place dough balls in muffin tin. Cut an "X" on top of each ball of dough with a knife. Bake 30 minutes, until golden and sound hollow when tapped on. Cool on wire rack. These rolls are best served warm with butter! Grease (or use cooking spray) a 8" round cake pan or pie dish. After kneading dough several times, form dough into round loaf and place in prepared pan. Cut an "X" across the top. Bake 375 degree for about 45-55 minutes, until golden and sounds hollow when tapped on. Remove to wire rack to cool. Oh my gooooosh, these look amazing! Love the close-up shot showing on the details. Yum. These look perfect. I love a simple roll that I can throw together. I’m super excited about the chives and cheese! Yum! These are calling my name. I haven’t made bread in such a long time, but you’ve convinced me to get my act together. I need to make these. Gorgeous pictures! Oh man my low carb diet hates these but my tastebuds are all about them.